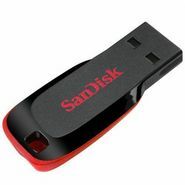 Take your favorite files with you on the small and very portable Sandisk 16GB Cruzer Blade USB flash drive. Sleek in style and great in value, just pop your pictures, tunes or other fun files onto the Sandisk 16GB Cruzer Blade USB flash drive and start sharing with your family and friends the small, swift way. It is easy as can be, all on SanDisk is smallest flash drive made for your pocket.